It’s been blistering hot here in Southern California lately, so scorching in fact, that it’s too hot to barbecue or even turn on the oven. So, what to make for dinner? Soup…chilled soup that is. I turned to my favorite soup cookbook, Sunday Soup by Betty Rosbottom, for a recipe. 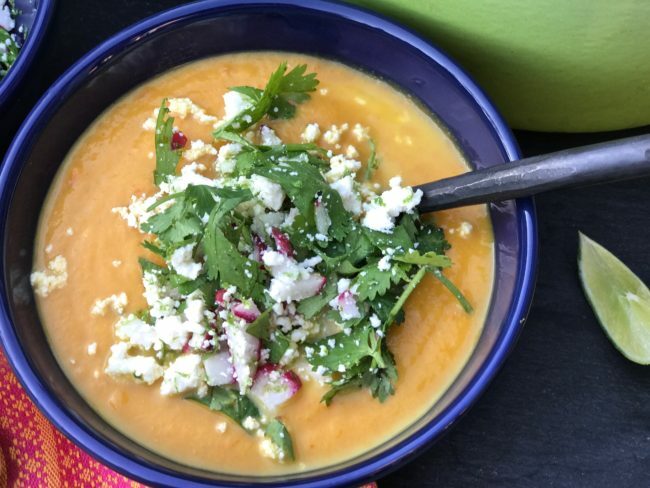 Tom wanted a chilled cantaloupe soup, but I vetoed that, opting instead to make the Chilled Carrot Soup with Cumin and Lime. To make this a little more robust for a meal, I added a garnish of diced radishes, cilantro, lime zest and some crumbled Queso Fresco. Avocado would be a nice addition too, but I didn’t think of that until now. The original recipe calls for sour cream, but I opted for plain Greek yogurt. As you know, we like it spicy, so I pumped up the crushed red pepper flakes to one teaspoon. Yow! Good stuff, but unless you like it hot, stick with the original recipe shown below. This soup has to chill for at least three hours, but overnight is better if you have the time. Purchase your carrots with the tops on as they are sweeter than ones without them. Also, although you may be tempted to use the pre-chopped carrots (and I am definitely guilty of this too! ), it only takes a few minutes extra to peel and chop your own. The flavor boost is definitely worth it. 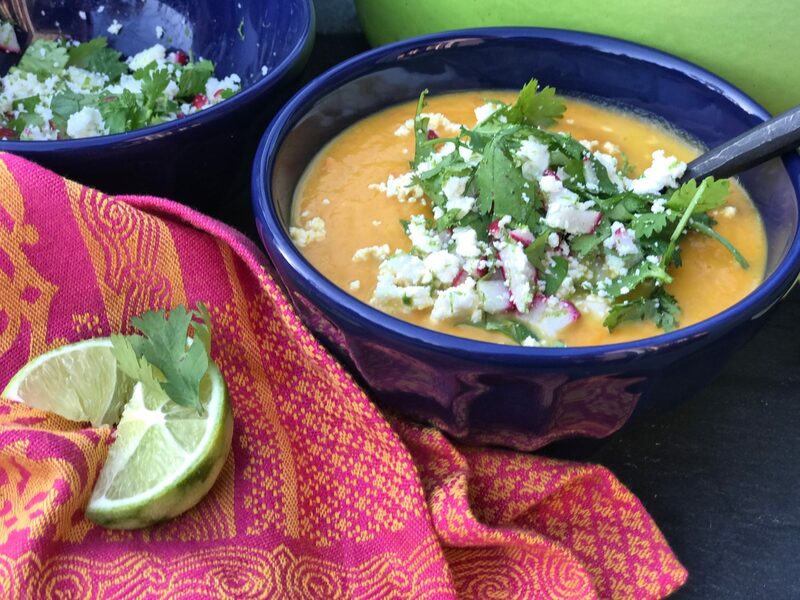 Spicy and cold, this soup is easy to make and definitely gives you a good start on your Five-A-Day. It’s a great way to chill out on a hot day. Stay cool! Heat oil in a large, heavy pot over medium-high heat. Add the carrots, leeks, and garlic and sauté until the leeks begin to soften but not brown. This took about 10 minutes in my pot. Stir in the cumin and crushed red pepper flakes, sauté for another minute until the cumin becomes fragrant. Add chicken broth being sure the veggies are completely covered with liquid. Bring to a boil, reduce heat and simmer uncovered until the vegetables are very tender (about 30 minutes). Using an immersion blender, puree the soup in the pot (or let the soup cool and then puree in batches in a food processor or blender). After the soup has cooled, whisk in the sour cream or yogurt, and season to taste with salt and fresh ground pepper. Cover and refrigerate for at least 3 hours or overnight if you have the time. 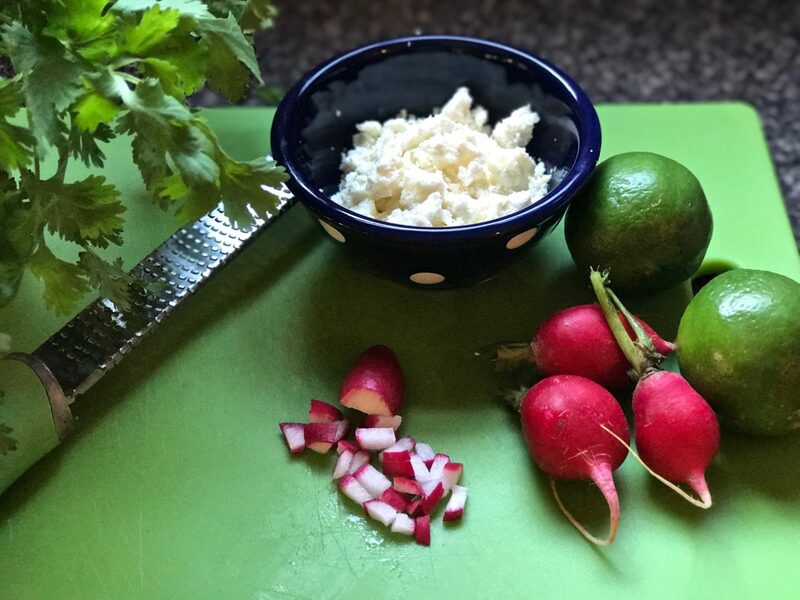 To serve, assemble your garnish of chopped radishes, chopped cilantro, the reserved lime zest and crumbled Queso Fresco in a small bowl. 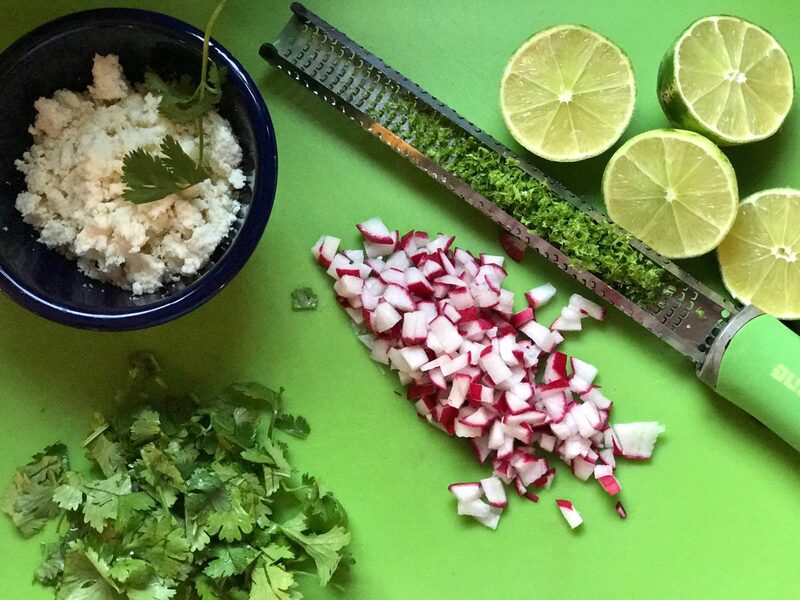 Stir the fresh lime juice into the soup. Thin the soup with additional broth or water if too thick. Top with the garnish. Enjoy!